Steve in action at the 2015 Asian Cup Tournament. 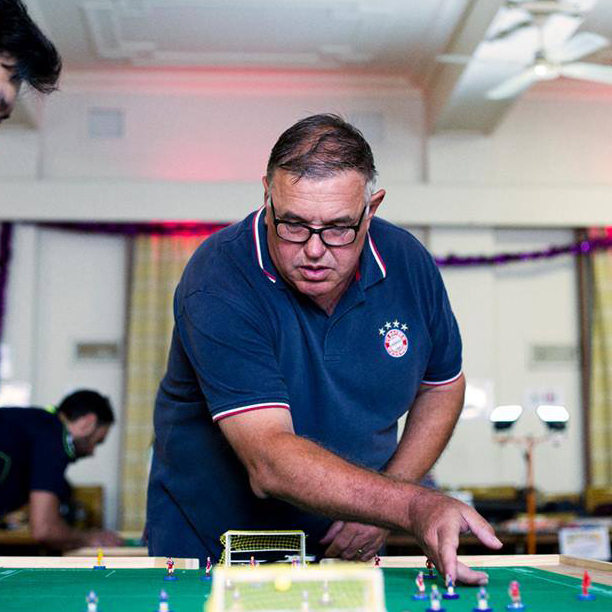 Steve Dettre is not only the historic organizer of Subbuteo in Australia, he was also one of the founders of FISTF in the early 90s and he keeps an interesting view on the evolution of the game and on the new generation of players Down Under. SD: I played through the 60s, just with dad and a few mates, then in the early 70s I discovered a schoolmate who had learned the game while living in England. We used to play every Friday night during school terms: one week I’d go to his place, we’d play for hours, have dinner, play some more, then the next week he’d come to my place. After a while we wondered if there was anyone else playing in Australia? Subbuteo Sports Games sent me a list of people who had contacted them, and I discovered a whole bunch of players. At the same time, Paul Magee put an advert in the local soccer paper, Soccer World, run by my dad, and the next thing we knew, we had a growing scene from 1976 to 1979. We organised a few tournaments, but it all collapsed when players left school, got jobs, and discovered girls!!!! In 1986 it all got revived, when Gary Hosie started a small league in his home. Once again it took off, and we eventually ran clubs around the country, in Cairns, Brisbane, Ipswich, four clubs in Sydney, Gerringong, Melbourne and two in Hobart! We had nationals, teams tournaments, and ran Australian Grand Prix, with international stars like Willi Hoffmann, Renzo Frignani, Axel and Wolfgang Schneider, coming to play. We also had a tour by the German national team, and Gary played in the 1990 world Cup, then we took a five man contingent to the 1994 tournament. It all came to a halt again when other demands on my time came along in the shape of three kids and a growing career. Then in 2010 it seemed to kickstart again and things have been looking good. SD: It’s just a great game. It has tactics, technique and a requirement for mental toughness and quick thinking. It’s also a great social game. SD: I guess they are many and varied. But playing at the 1994 World Cup as part of the Aussie team, and winning our match against Norway was probably the highlight. SD: Gary Hosie was easily my toughest opponent on a regular basis. He had skill, technique, tactics and was absolutely relentless. You could never just “relax” even when you had the ball. He would pursue you even in your own shooting area! For that reason I would also name him my favourite player. SD: Great question. At its highest level, it’s clearly approaching sport; but there are still many areas that need to be sorted out, both in the rules and the application of those rules among players. SD: We need to dramatically increase the number of players U15 who play. It’s well and good having players coming back into the sport, but without a younger generation coming through to play, and then running the sport, our future is limited. We need to work with all manufacturers to make affordable starter sets, get them in sports stores as well as toy stores. SD: You must read and learn the rules. My sons and I have played other games over the years, and the key is always to know the rules. On top of that, you need to develop a good flicking style. As the Brazilians say with football, you need to be able to “feel” it through your finger, the deftness, the angles. You get that though practice, but you also need to be capable of “doing the unexpected”. To improve you need to play against better players, in tournaments, and analyse your matches. I love the cooperation, the fact that they cater for different markets, but also the same. We look forward to staging more tournaments for both in Australia. SD: Rankings are nice, but I play for myself. How I play on a day, whether I defended and shot well, whether I had a good time against my opponents, that’s what matters to me. Job: Event Services Director for Infostrada Sports, a global provider of sports content and media services for international federations and large sports events. Hobbies: Table football, Warhammer, gardening. This entry was posted in News, Player Profiles and tagged profile, steve dettre, waspa on 28/01/2015 by ajebec.